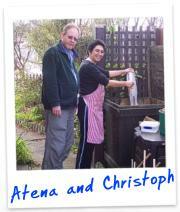 Atena and Christoph have two young children, and a very busy life. They humored me with "beta-testing" one of my early Hungry Tiger systems (to keep me quiet!). When they started they had little experience with composting kitchen waste, but now they recycle 100% of their organics through the Hungry Tiger. "It's easy and amazing - the waste just disappears," says Atena. They moved household once, and the system shifted easily. They can harvest 4 buckets of vermicast every 3-4 months. With working full time, and participating in many extra-curricular activities, Jean wanted a system that was easy and fit into her busy lifestyle. She had never composted organic waste, or had a garden, but when she became a homeowner, she inherited a huge organic garden. With her two housemates, Jean's household of 3 hungry vegetarians recycle all their household organics - including lots of brown lunch bags, paper toilet rolls, paper packaging. 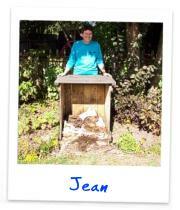 "I didn't think I could do it, but Annmarie made it easy - and it's amazing to watch the waste just disappear," says Jean. Her garden certainly responds well to the regular supply of vermicast. Shannon is my "DIY champion". For many years he watched me work with the worms, taking bags of food scraps from his home. Despite offers for free systems and heaps of discussions, he refused to take the bite. "You won't get me recycling food scraps", he'd say - "I'm too busy." This went on for three years! Shannon works full time, and cares for his two kids much of the week. He loves to work around his home and build things, so one day he built his own worm bin, and called me for the right worms. Now, he's recycling 100% of his kitchen scraps, occasionally snagging food scraps from his friends, he stopped taking grass clippings to the tip... and now frequently shows off his worms (he's so proud). Personally, I think I've created a monster! Anyway, he's one of my favorite recycling heros, because he turned a complete 180. 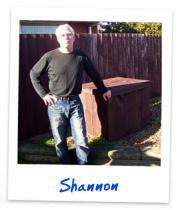 Although Shannon relied on me for advice - He D.I.Y. 'd the rest! The grandkids gave Annmarie her Can-O-Worms recycling system, and then bought the Compost Worms from Earthly Delights. When she picked the worms up at the factory, she also paid a visit to Worm Alley. Like many other customers, Annmarie was able to see her systems in action, along side other styles of worm farms, and talk about how to manage her Can-O-Worms. "I've learned so much, and feel so much more confident" says Annmarie. "And the extra supplies make it much more easy." Annmarie received supplies and instructions to "jump-start" the Can-O-Worms so it matures much faster. Earthly Delights also showed Annmarie how to clean the system, and how to get more waste through the unit and keep it healthy. By email, Alexandra wrote: "I was absolutely delighted with the level of customer service that I received in regards to my worm order, I will be sure to recommend you to anyone I know who is starting up a worm farm in the future!" By email, Janelle wrote: "I can't begin to tell you how much I enjoyed your presentation at the Fruit and Vegetable circle on Wed's night. Your enthusiasm and knowledge is very inspiring!" Earthly Delights was able to give her more information on books, DIY, and other gardening tips. Earthly Delights have recycling systems in over 140 schools, Preschools, and businesses. 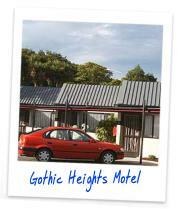 Contact us us if you would like further references.